I am Inviting You to Join my Monthly Natural Alternatives Newsletter to Receive News and Information about Alternative Medicine, Holistic Healing, Natural Healing, Natural Diet and Weight Loss and to Receive Occasional Special Offers. You will be receiving the Newsletter on or arround the first of each Month, starting with the next issue. Every month more and more e-zines are bouncing back. If you have a free e-mail account and you have already signed up and never received my newsletter this might be the reason. Many ISPs and email hosts have begun to install strict spam filters. This may block my newsletter that you want to receive. 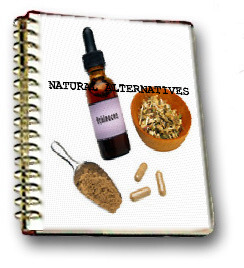 It is important that you add my email address Natural_Alternatives@natural-health-and-healing.com to your "whitelist" or contact your Internet Service Provider in order to receive my newsletter. If it is possible please avoid free e-mail accounts. Hotmail Users: Place the domain www.natural-health-and-healing.com on your Safe List, so that you can receive our emails. The safe list can be accessed via the "Options" link next to the main menu tabs. AOL: Place the domain www.natural-health-and-healing.com in your Address Book. Yahoo! Mail: If my e-zine is filtered to your 'bulk' folder, open the message and click on the "this is not Spam" link next to the "From" field. The same goes for any other e-mail you receive that doesn't belong there. I promise to use it only to send you Natural Alternatives.